The healing properties of turmeric have been known in Ayurvedic and Chinese medicine for centuries. Curcumin, an active compound in turmeric is thought to have anti-inflammatory, antioxidant and anti-cancer properties. Occasional use of over the counter painkillers is safe, but more regular use can cause liver damage, gastric bleeding and increase the chance of a heart attack. Women who are pregnant or planning to be should also avoid pain medications where possible – aspirin and ibuprofen may increase the risk of miscarriage, as well as cause damage to your baby’s developing organs. Recent research has suggested that paracetemol use in pregnancy may be linked to the development of behavioural problems in children. Concern over these risks has lead researchers to look for natural alternatives. A meta-analysis of 9 random controlled trials found that curcumin supplements decrease the production of cytokines, compounds involved in inflammation. Another meta-analysis suggested curcumin was as effective as ibuprofen for joint pain. 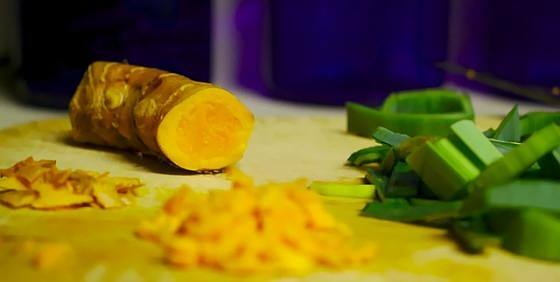 Evidence of the anti-cancer properties of curcumin has been found in animal studies but is yet to be confirmed in human trials. While the research is promising, what isn’t known is how much turmeric we need to consume to have health benefits. The best approach is probably to include small amounts every day, either as part of a meal or as a supplement. Whether you’re taking turmeric as a supplement or in your food, try to include some fats and black pepper with it – both have been shown to increase the bioavailability of curcumin. Delicious ways to include more turmeric in your diet include this golden latte, a warming and comforting way to get your turmeric, every day. Combine spices in a small saucepan. Add a small amount of water and bring to the boil, combining the spices into a paste. Add your favourite milk, stirring as it comes to the boil. Pour into your mug, top with extra cinnamon if you like and enjoy!